Middletown is a city located in Middlesex County, Connecticut, along the Connecticut River, in the central part of the state, 16 miles (26 km) south of Hartford. In 1650, it was incorporated as a town under its original Indian name,Mattabeseck. It received its present name in 1653. Middletown was included within Hartford County upon its creation on May 10, 1666. In 1784, the central settlement was incorporated as a city distinct from the town. Both were included within newly formed Middlesex County in May of 1785. In 1923, the City of Middletown was consolidated with the Town, making the city limits of the city quite extensive. Originally a busy sailing port and then an industrial center, it is now largely residential with its downtown serving as a popular retail, dining, and entertainment district proximal to Wesleyan University. Middletown was the county seat of Middlesex County from its creation in 1785 until the elimination of county government in 1960. As of the2010 census, the city had a total population of 47,648. 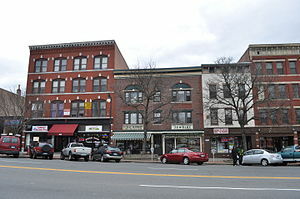 Middletown, Connecticut is considered the southernmost city in the Hartford-Springfield Knowledge Corridor Metropolitan Region, which features a combined metro population of 1.9 million.